Watch this video for instructions on how to use this guided field knife sharpener by WorkSharp! The Work Sharp Guided Field Sharpener 2.2.1 is the complete knife and tool sharpener for field applications. Equally at home in your pack, tool box, tackle box, glove box, go bag, boat, quad, or anywhere else you keep knives and cutting tools. 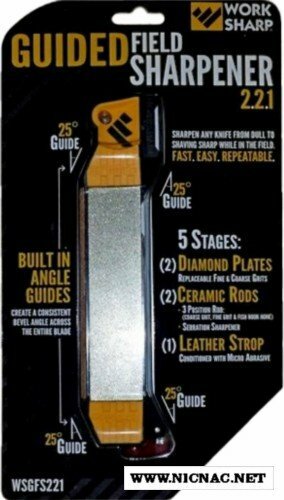 It is the first angle guided, 5-stage sharpening solution designed for sportsmen who need a compact, complete and versatile field sharpening tool while on the go. The sharpening guides are purpose built for your hunting knives, pocket knives and filet knives, making easy work of sharpening flat, curved and serrated blades - as well as camp tools such as axes, hatchets and machetes. Strong rare earth magnets secure the diamond grit plates in place and also provide a cover for the broadhead wrench and small storage compartment. Compact design andlanyard hole make it easy to pack and carry on any excursion, keeping you prepared with sharp edges when you need them most. The Work Sharp Guided Field Sharpener 2.2.1 is assembled and quality checked in Ashland, Oregon and comes with a Limited Lifetime Warranty. Includes a detailed User's Guide in the storage area under the diamond plates.